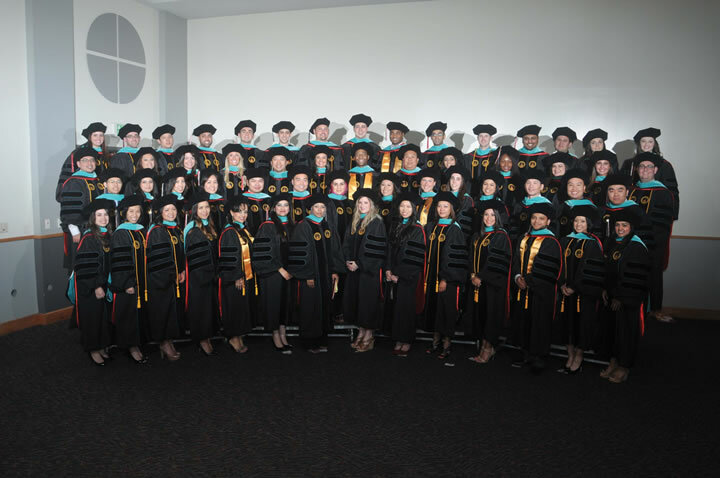 The inaugural class of RSO gathered at the Hooding Ceremony on May 9 in the McCombs Center Rosenberg Sky Room. 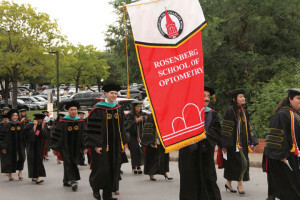 On May 10, the University of the Incarnate Word’s (UIW) Rosenberg School of Optometry (RSO) made history by graduating its inaugural class at the Spring 2013 Commencement ceremony held in the Alice P. McDermott Convocation Center. 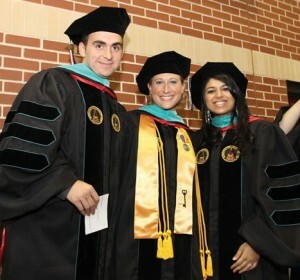 Earning their Doctor of Optometry (O.D.) degree, the Class of 2013 was comprised of 58 students from 17 states and several countries including Canada, Mexico and Nigeria. 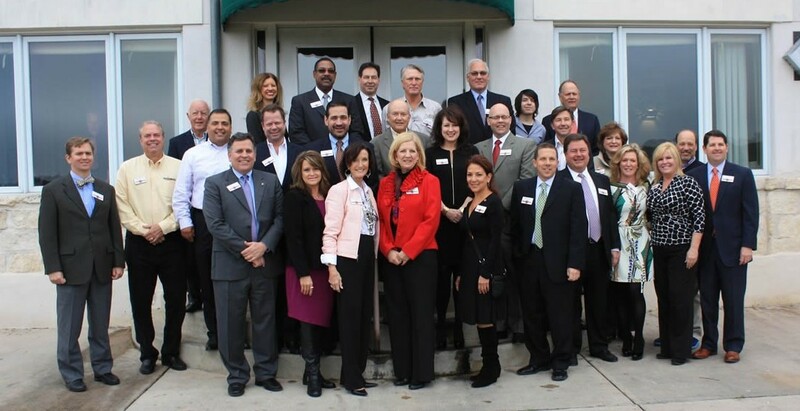 Since RSO’s inception in 2009, these graduates have established and built a reputation of excellence as vision care providers and have set the bar for future RSO students. Indicative of the perseverance and resilience of the Class of 2013 are the seven students who graduated with honors. The valedictorian of the inaugural class was Samantha Susan Rieger and co-salutatorians were Briteny Brunner Allison and Martin Vicente Diaz. Buzzelli said some of the students plan to return to their home states and countries to practice but many will practice in Texas as licensed optometrists. Allison plans to join a general practice in rural northeast Texas and Diaz will head to Vermont to complete his residency in primary care at the White River Junction VA Medical Center. Rieger, who plans to serve the nation as an optometrist and Captain in the United States Army, said the inaugural class members were trailblazers in establishing the RSO program. For Diaz, it meant a great deal to be among such a pioneering group. “I like to do things differently and get an experience that no one else will, and pave new ground being a part of the first class,” he said. RSO graduates of the inaugural class follow a procession on campus for the spring commencement. 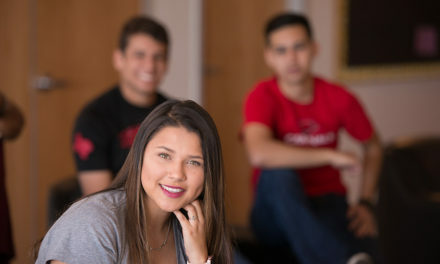 Kristine Benne, RSO director of student affairs who has been with the program since 2009, concurs that the inaugural class has directly contributed to its success and growth over the years. Specifically, she cited their expansion of student organizations. When Rieger entered the program, she had no prior optometry experience but had the mindset of learning to provide the best patient care possible and not to simply pass exams. And she believes her training at UIW prepared her to deliver such superlative vision care. To achieve their degree, the graduates of the RSO underwent a rigorous four year curriculum earning a minimum of 206.5 credit hours. Throughout the duration of the program, they received didactic and clinical laboratory instruction with all courses integrating and emphasizing clinical applications and scenarios. 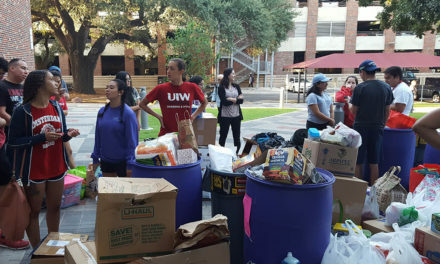 In their third and fourth year rotations, they applied their training in professional settings to include the UIW Eye Institute, the San Antonio Lighthouse for the Blind and various CommuniCare health centers. The curriculum even entailed courses in practice management to emphasize the skills essential to maintaining a business or private practice. “The RSO curriculum and clinics have provided the Class of 2013 with a solid education and resource network for continued support,” stressed Rieger. However, Rieger and Diaz indicated that establishing the RSO was at times a trial and error process. “Overall the best thing I can take away from my RSO education is to be adaptable to change,” added Diaz. 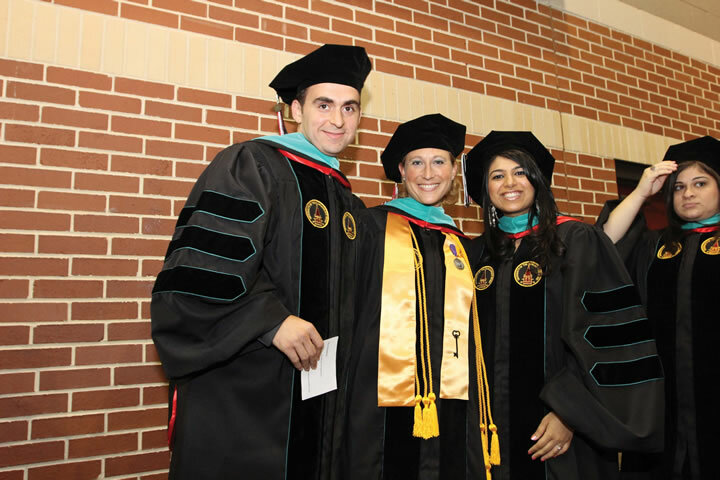 Samantha Rieger (center) with fellow graduates of the RSO inaugural class Nevi Ramsey (left) and Sunaina Sakhuja (right) during spring commencement. Since the RSO is one of only 20 optometry programs on the United States mainland and one of two in Texas, the inaugural class has also made an impact on a statewide and national level.